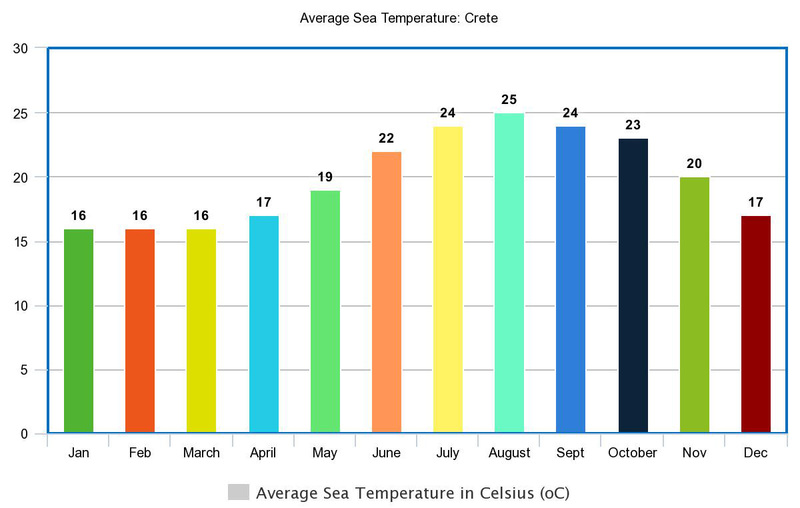 Crete's climate varies between temperate and subtropical, with an annual average precipitation of about 25 inches (640 mm) and hot, dry summers. Winter temperatures are relatively mild. Mountain air is temperate and cool, and the mountains are often covered with snow in the winter (mid December to May). I During February and March there is so much snow in higher altitude which is very common to do cross country ski! Crete gets strong katabatic winds due to its mountains and gorges. Katabatic wind also called downslope wind , or gravity wind is a wind that blows down a slope because of gravity. The air in contact with the high mountains is getting cooled as its going up and it becomes denser than the air at the same elevation but away from the slope; it therefore begins to flow downhill. This process is most pronounced in calm air because winds mix the air and prevent cold pockets from forming. 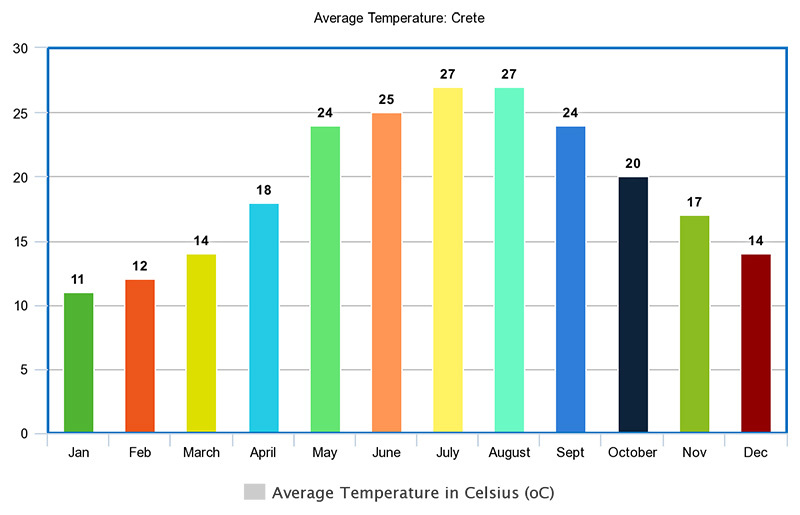 July is the hottest month in Crete with an average temperature of 26-27°C (79°F) and the coldest is January at 11°C (52°F) with the most daily sunshine hours at 13 in July. The wettest month is December with an average of 89mm of rain. The best month to swim in the sea is in late August, early September when the average sea temperature is 26-27°C (78-80°F). In a very warm day in the south of the island the temperature might go up to 44oC during the day; that is not common however and usually it doesn't last more than 2-3 days once or twice a year. On the other hand during a cold day in the winter is not uncommon to have snow even at or very close to the sea level. During 2015 & 2016 we had a quiet strong winter and lots of snowfall even at the sea level while near the high summits the temperature was below -15oC! Especially its sailing maps are excellent source to get an idea about katabatic winds when you are planning your kayaking trip or any other outdoor activity.